A City Council incumbent has not lost in San Diego in 27 years. If current results hold, two fell Tuesday night. One of those historic wins shifts power at City Hall to the Democrats. They have a 6-3, veto-proof majority after first-time candidate Jen Campbell knocked off Republican Lorie Zapf in District 2, the coastal district including Pacific Beach, Ocean Beach and Point Loma. Democrats have not signaled what new policies, if any, they intend to push with their newfound edge. But they now have extra leverage in negotiations with Republican Mayor Kevin Faulconer, and reason to expect their growing voter registration advantage in the city is turning into electoral victories. The other potential upset of the night won’t change the Council’s partisan makeup but could be just as disruptive. 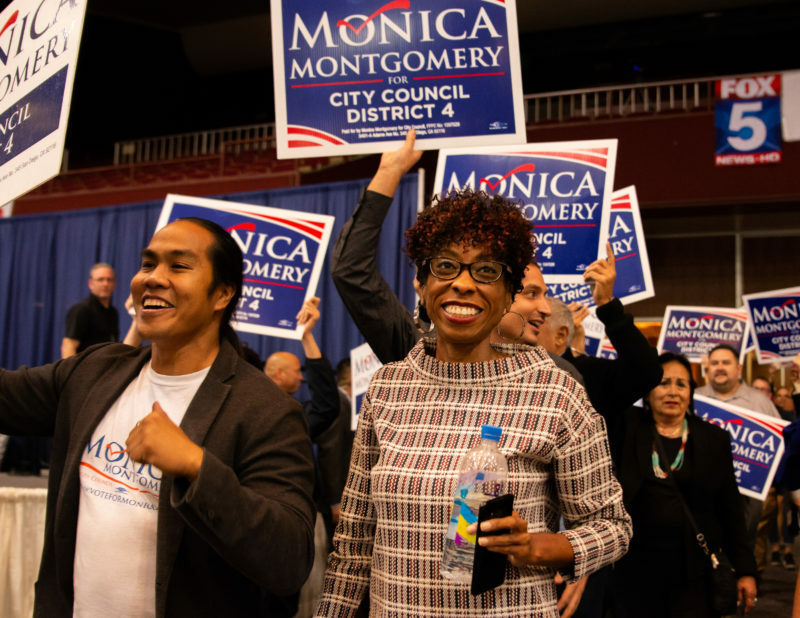 Democrat Monica Montgomery had a 9-point lead early Wednesday morning over fellow Democrat and Council President Myrtle Cole. Montgomery used to work for Cole, but quit after controversial comments Cole made on racial profiling in 2016. Cole was not just the Council president. She also had the support of the county Democratic Party, organized labor and most major elected Democrats in San Diego. Faulconer himself steered business interests to support her as well. Yet she now trails Montgomery, who ran an insurgent grassroots campaign that resonated with community members from the city’s southeastern neighborhoods who felt Cole had neglected their concerns and lost touch with their interests. In the closing days of the race, labor-backed groups sent mailers alleging that Montgomery was a secret Republican who couldn’t be trusted. The community saw through it, Montgomery said, and delivered a message. Cole finished in second in June’s primary, too, the first signal to City Hall insiders that she had serious problems in the district that had gone unnoticed as media and party attention focused downtown. In the months since, District 4 voters have announced their dissatisfaction loudly and clearly. They remained upset with her comments two years ago, in which she seemed to excuse racial profiling by saying black people were committing crimes. But voters also voiced displeasure with how often Cole visited the district, and with the pace at which basic quality-of-life issues there were improving. Residents tired of waiting for new businesses to open, and for new homes and new infrastructure improvements that are always promised but just on the horizon. Montgomery herself said she did not actually decide to run against Cole immediately after she quit over Cole’s racial profiling comments, as has been reported. She settled on running in March 2017, after she became fixated on two issues in which she thought Cole had failed the community. 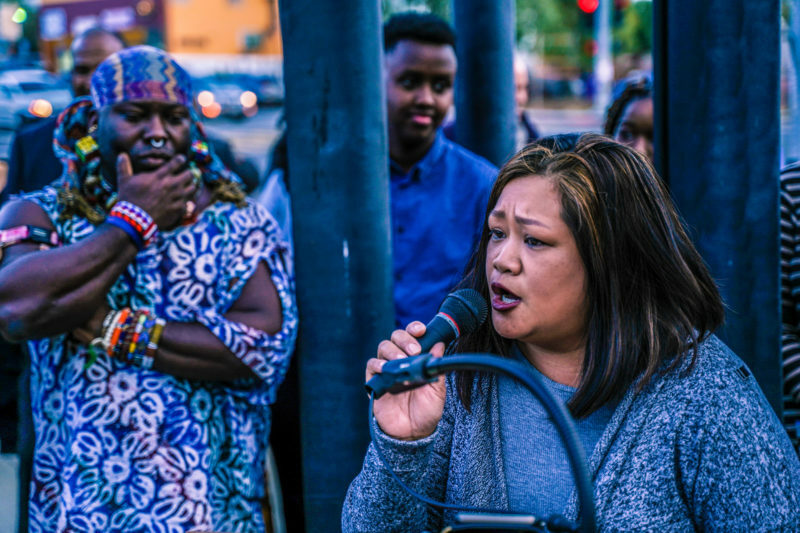 One was that Cole didn’t push the Council to adopt any policy changes after SDSU researchers completed a study on racial profiling that showed evidence of bias in traffic stops. The other was the lack of progress by the nonprofit Jacobs Center for Neighborhood Innovation in developing over 30 acres it owns in the community and has promised to use to spur economic development. Nothing was happening, Montgomery said, and that didn’t seem to bother Cole. It looks like the community will have its choice. Bill Ponder, a long-time community leader who previously ran for school board in the district, said Montgomery’s victory – if it holds up – should send a message to labor and other outside groups: Your playbook is played out. “People might finally decide, why should we have other people outside our district – whether it’s labor or business groups – come into our district and dictate to us?” he said. The personal attacks labor made against Montgomery, he said, will be hard to forget. Other Montgomery supporters with deep roots in the district held a press conference late last week to deliver the same message. Tuesday night, another high-profile figure in the district – public defender Genevieve Jones-Wright, who ran unsuccessfully for district attorney in June but who did well in the district – said Montgomery showed that money doesn’t matter when you have the community behind you. The news for local labor wasn’t all bad Tuesday night – they invested heavily in Campbell’s victory, and in former Assemblyman Nathan Fletcher’s successful bid for county supervisor, among others. But Cole wasn’t their only apparent misfire, either. The City Council will have another new face, and it appears to be another Democrat who won without help from the Democratic Party or labor. Vivian Moreno, a staffer for Councilman David Alvarez, is winning her race against San Ysidro School Board member Antonio Martinez by 5.6 points early Wednesday. She had support of the Municipal Employees Association, the union for white-collar city workers, and Democratic officials like her boss, Councilwoman Georgette Gomez and former Councilwoman Donna Frye. But the Democratic Party posted a Facebook ad saying she was the choice of Trump Republicans, and many of the most powerful elected officials in the South Bay opposed her, as did the San Diego-Imperial Counties Labor Council and the San Diego Building and Construction Trades. Moreno and Martinez had a lot in common on the issues. They split on rent control – she opposes it – but were otherwise close to each other. The disagreements in many ways amounted to old rivalries. There was one other Council election Tuesday. Republican Chris Cate, bucking the trend, won his re-election bid against Democrat Tommy Hough. It wasn’t close, with Cate leading by 14 points early Wednesday. Cate said he’s concerned with how city politics are developing. He’s used to having solid relationships with Democrats on the Council, but isn’t sure that will happen now that they have a veto-proof majority. “I hope it’s a Council that will have a conversation with each other, but given the comments some of my new colleagues have made about me in the past, I’m not hopeful,” Cate said. He wouldn’t say what comments he’s referring to. But in her interview with the Union-Tribune’s editorial board, Campbell said that Cate “gave away city secrets,” referencing his decision to give a confidential city attorney memo to developers behind the failed Measure E proposal. “I don’t have respect for him,” she told the Union-Tribune.